I gaze at his picture and wish he would just leap out of it into my arms – my son, Chikoo. The laptop sits in front of me, on the table; the keys waiting to be tapped and words waiting to spill onto the blank screen. But, not a single thought enters my mind, except that of my baby. I ought to begin living again, but, the heart has a mind of its own, and it won’t pay heed to my practical advice. And so, there I sit, lost in Chikoo’s thoughts, unable to bring myself to write a word. Of course, there are days when I write like crazy, but those days are few and far between. Most of the days are such, you know, when there are a hundred thoughts swarming around in the mind, but the heart is just not into it. No post gets written, no sketch gets made, the mundane chores of everyday life get done haphazardly. Nothing seems to motivate me to get up and get going. Thankfully, my luck, it seems, can’t bear this sight of me sitting idle with a wan smile, looking all lost, and so it brings a beautiful ‘something’ for me that it knows is bound to cheer me up! First, it gets my blogger friend Shalini Baisiwala to tag me in a post on the Facebook Page of Matrika Paper Products; then, it gets me to register on their site where I discover the amazing Creative Women’s Journal. 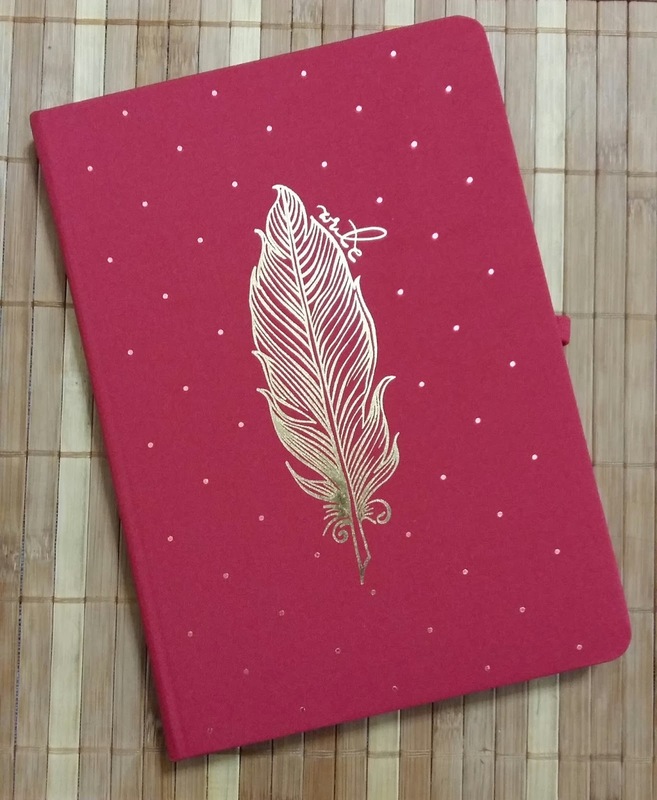 Finally, one fine day, when my energy levels are at their lowest, my luck knocks on my door and hands me this vibrant, red notebook with a beautiful golden quill on the cover with the word, “Write” at the top. And, that’s just what I begin doing! Colours, as we know so well, add life to the world around us. The vibrant hues are those that rev up the energy levels with their brightness, driving away the gloominess and adding zest to life. So, if one was to receive such a vibrant gift to be used to write, doodle, scribble one’s thoughts, dream and plan for the future, how wouldn’t one feel alive again? And, alive is just how I have been feeling ever since the beautiful journal landed in my hands. My first colouring activity and some thoughts I penned. The journal opens up to the first page where you fill in your details, and then turn over to a short note for its users about all that they can expect inside this magnificent little book. It consists of 8 adult colouring pages with pictures inspired by nature. Colouring is the most therapeutic activity I have indulged in right since childhood. However, since some time now, I have been away from it for lack of enthusiasm, so, these colouring pages feel like manna to this gloomy soul. The journal also has some plain pages for all the times when one feels like doodling their thoughts away. Like I do when I write in a book. The margins of most pages are crowded with doodles that tend to help me creatively in a way I really cannot explain. For me, doodling is cathartic and this pretty book gives me an opportunity to doodle when my mind goes on its own trip to some fantasy land, leaving the words aside for a while. So, there will be not just writing, but colouring as well as doodling! Isn’t that great? The stickers that voice your emotions. 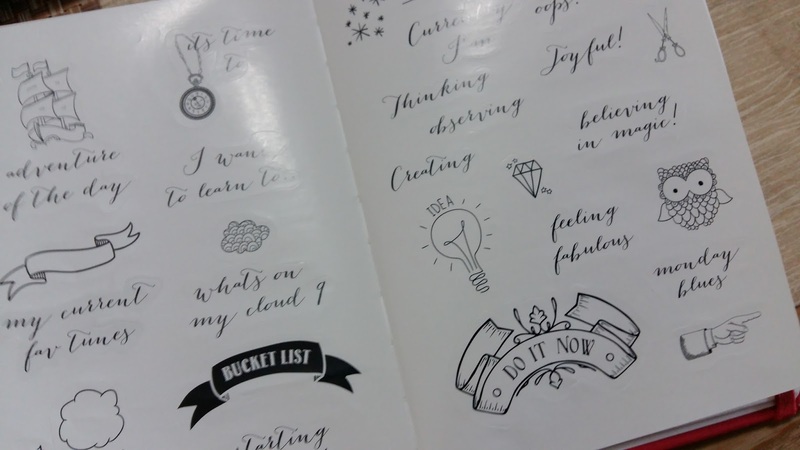 To add to the list of lovelies in this pretty journal, there are stickers for the various moods that we experience at any given time, some encouraging messages, some to-do stickers to embellish your to-do lists and motivate you to reach for those stars. There are also pages with “Books to be read” and “Places to be visited” lists at the end that I intend to fill up, soon. These are going to be my dreams, for myself. We all ought to have some dreams for ourselves and work towards fulfilling those dreams. The satisfaction one gets at the end of it all is unparalleled. I am sure you know what I mean! 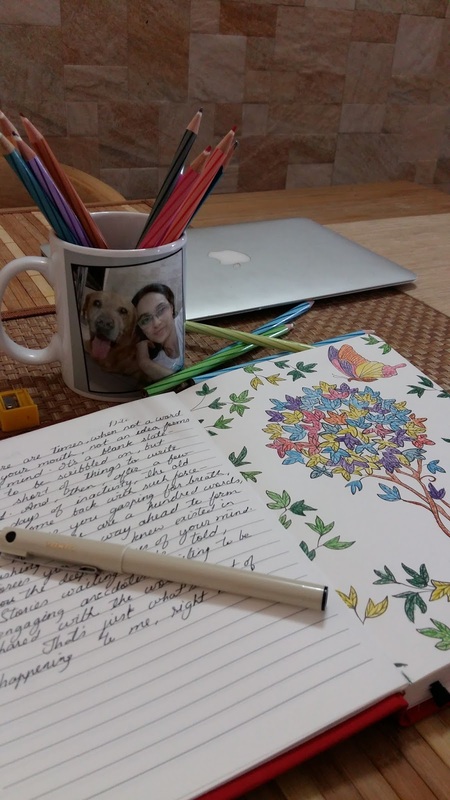 I began by colouring the first picture in the journal and jotted down a few thoughts that popped in my head at the end of my colouring activity. I am sharing the picture with you here. Let me tell you, it was a marvellous feeling I experienced as I used almost every colour I could lay my hands on for colouring. I suggest you try it out – colouring, doodling, penning your thoughts, planning and dreaming – every activity this journal encourages you to indulge in is therapy for a harried soul, and harried souls we all are, aren’t we? Do try out this journal. Visit the Matrika Paper Products Facebook Page and learn more about it all. I think I am going to get addicted to maintaining a journal after using my new gift! I am sure you will, too! Learning to live without the person whom we loved more than our life is one of the toughest things we humans experience during our life. Almost every moment of our day we spend in their shadows, enveloped in their love; we don’t even realise when they became an extension of our selves. We come to accept them along with their flaws, their peculiarities, which often have the potential to drain us of our patience. Yet, we love them, unconditionally, at times wondering how we survived before they entered our world. Often, we also wonder how we will ever survive after they leave our world. The human mind is such. Its ability to give birth to a thought and then mull over it however unpleasant it may be, is quite baffling! We realise we stand to lose our sanity if we don’t get rid of that negative thought; we understand how important it is to live in the moment and enjoy it with the loved ones we fear losing someday, yet we keep worrying ourselves to death about what would happen to us if, someday, this person would cease to exist. And, when that day does arrive, we find ourselves struggling, like a fish fighting to breathe when swept ashore by the cruel waves and left there to die. The person we depended upon for succour, is no longer around to offer it to us when we need it the most. We dwell upon those moments when we rushed to them to seek comfort during times of solitude and sadness. And now, as we grapple with those very emotions, we find ourselves all alone, unable to express to our near and dear ones the cause of our depression! We grieve for that one person who could read our mind and offer their unfailing support without us having to ask for it and look around, trying to find that support in the ones who are around us, but in vain. And, that’s when we realise what an important role some people play in our lives. That’s when we realise that learning to live without them is now going to be an experience we won’t get over any time soon! These days, the thoughts that crowd my already struggling mind are, is it wise getting emotionally attached to someone knowing fully well that someday they will be spoken about in the past tense, leaving our present in a state of misery? Someday, we all will have to part ways with our loved ones for a varied reasons; won’t we be leaving behind souls deprived of our love, or they ours? Then why can’t we teach ourselves to live a life of detachment; learn to be as dispassionate and remote from those around us as our foolish emotional souls allow us to be? It will be easier to deal with the loss – for them as well as for us – isn’t it? Maybe, these are the immediate aftereffects of the loss I suffered on my baby’s demise that cause my mind to come up with such cynical thoughts. Maybe, someday I will learn to live without him, and look back at our life together with great fondness, revelling in many a happy memory. But, until that ‘someday’, I will have to fight this loneliness and depression that haunts me, often taking me by surprise even in the midst of the varied activities I occupy myself with these days. Learning to live without this person I was so close to for close to thirteen years is going to be one of the toughest experiences of my life. Suffice it to say, I rue the fact that I wasn’t prepared for this battle. Hubby brought home a parrot to fill the void left by Chikoo’s passing away, and I am just not able to get myself to bond with this guy. I keep wondering if I am unable to bond with him because I don’t want to bond with him? He won’t be taking Chikoo’s place, for sure. But, I don’t want to give him any place, either. Not in my heart, no.